An organization called Outer Coast is gearing up to start a new two year college on the Sheldon Jackson College campus in Sitka. Their first step, this year, is to test out the curriculum and administration on a group of rising high school juniors and seniors. The curriculum, modeled after Deep Springs College in California includes three elements: classroom time, service work, and self-governance. 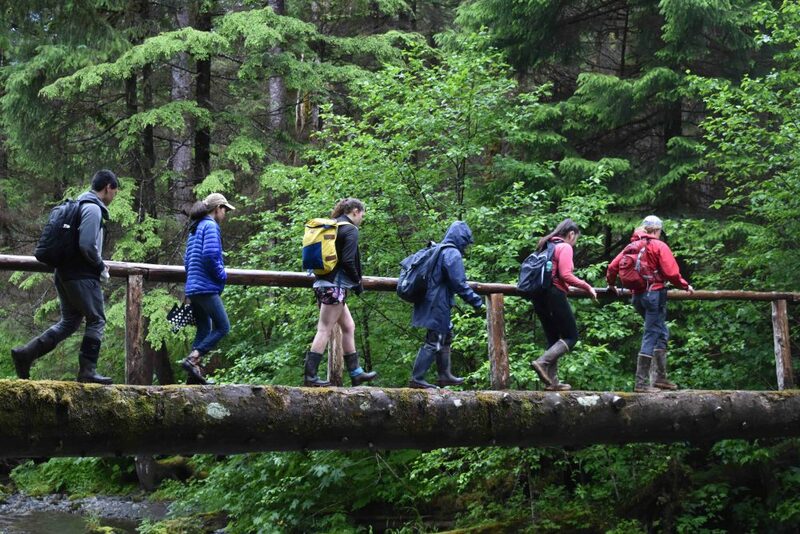 I’m with a group of sixteen high schoolers, at the head of the Indian River Trail in Sitka. We all tromp into the woods. The rain has been falling all day, heavy for a Sitkan summer. I ask a few students to hang back with me as we walk. The college will also likely have some arrangement that deemphasizes grades. But they want to make sure students can transfer to a four year college if they want. Jonathan Kreiss-Tomkins helped found Outer Coast partly as a way to offer a different kind of school. The education will include classroom time, service work–like this project–and self-governance, where the kids make their own rules and regulations. The students set their own curfews for 10pm on weekdays and 10:30pm on the weekends. They want to function well early in the mornings for their classes and activities. 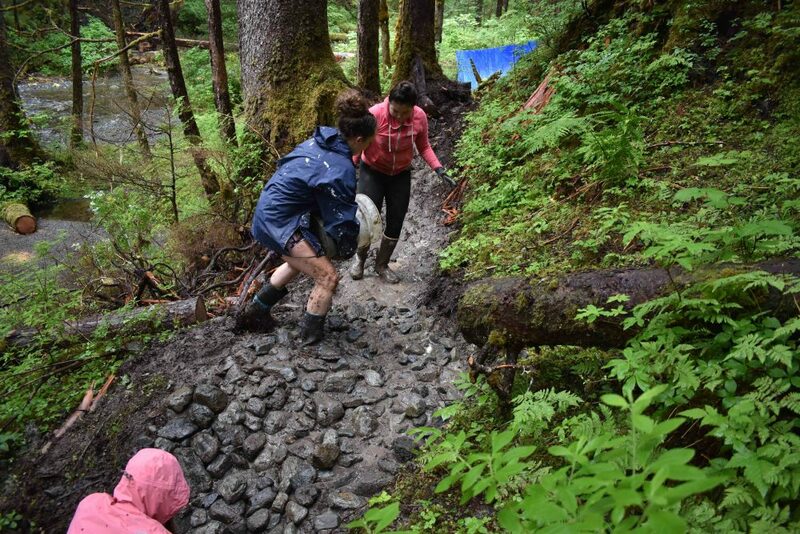 On the trail, we hop over puddles, climb over roots, and tromp through sticky mud. After about an hour and a half, we duck through a tangled trail and emerge in a mucky muddy path right next to a stream. Immediately the crowd divvies up buckets and a few kids jump down into the river bed and start collecting fist-sized rocks. Once the rocks are collected, other students take the buckets and dump them on the path, stomping on them to squish them in. Outer coast hopes to offer something different for their students, a balanced education that supports the whole person. They’ll likely be testing the program again next summer with more students, and perhaps after that, open their doors to undergraduates. This article has been corrected. Deep Springs College is in California, not Colorado, where we originally stated.